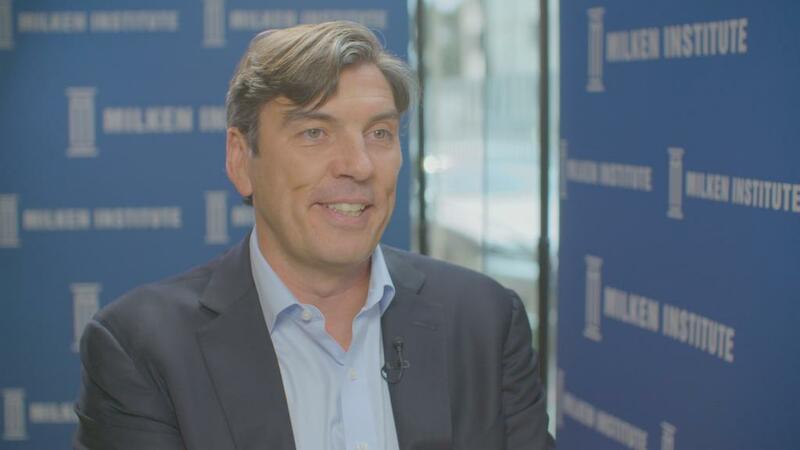 Tim Armstrong, CEO of Verizon's Oath, says the consolidation of tech, media and telecom will likely grow more intense as companies race to keep up with consumers' "massive shift" to mobile and over-the-top services. "People are trying to position themselves for whatever their weakness areas are and make them strengths," Armstrong said in an interview with CNNMoney's Dylan Byers at the Milken Global Conference. "It used to be that companies merged. Now ... industries merge," he said. "If you look across different sectors like retail and financial services and media and tech, there's a lot of activity and it is driven by keeping up with consumers." This is why the Justice Department's lawsuit to block AT&T's purchase of CNN parent Time Warner is being watched so closely across tech, media and telecom, he said. "It's a giant signal of how Washington is going to treat M&A overall. It will landscape things for the future." Another mega-merger Armstrong is keeping his eye on is between Verizon rivals T-Mobile and Sprint. Although he said he doesn't yet have a specific opinion on the proposed merger, he's comfortable with Verizon's position in the marketplace. "We have 100 million people on that network. We have a billion people at Oath. So we've really reached into the reach of the digital consumer," Armstrong said. "The ability to put Verizon with mobile, together with the scale of a billion users at Oath, and serve them news, sports, entertainment, finance and things like Riot, our AR/VR company is really powerful." Another piece of Oath's future is Yahoo, and Armstrong said he's working on bolstering the beleaguered internet giant so the Yahoo user "can very easily navigate through a whole mobile landscape and through all the web landscapes." He's also focusing on one of the buzziest topics today: privacy. "I also think it's going to be, strategically in the future, one of the battle ground areas where the companies that do well respecting privacy and do well with safety and security, it's going to be an important part," he said.